On November 17, 2016 we participated at the first 4 per 1000 consortium meeting in Marrakech, Morocco during COP22. 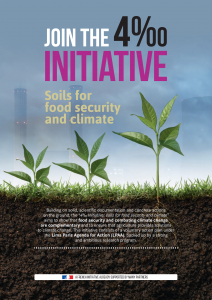 Formally launched on December 1, 2015 at COP21 in Paris, 4 per 1000 calls for countries to increase soil carbon content worldwide by 0.4% per year. 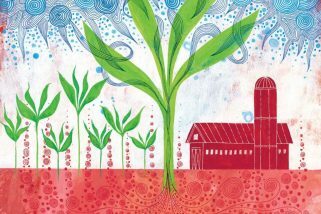 The initiative brings together national governments, local and regional governments, companies, trade organizations, research facilities and non-governmental, public-interest organizations, to implement local programs for carbon sequestration in soil. This can be achieved using a variety of methods include agroecology, agroforestry, and conservation agriculture. Center for Food Safety’s Soil Solutions team was truly honored to be invited to participate in the launch of this ambitious, solutions-oriented initiative and to be the first NGO signatory (along with our sister organization, Foundation Earth). Soil Solutions is currently working to get more governments and organizations to join this game-changing initiative! We’ll be at the first 4 per 1000 consortium meeting in Marrakech on November 17, 2016 where we’ll be briefed on scientific work and pilot projects.